The Nigerian Navy (NN) on Friday released a newly-adjusted timetable for final selection of successful candidates for the 2017 recruitment exercise. This is contained in a statement signed by the Ag. Director of Information, Naval Headquarters, Navy Capt. Suleman Dahun, in Abuja. “We want to inform the general public and the candidates, who were successful in the 2017 Recruitment Aptitude Test held nationwide on Aug. 12, that a newly-adjusted timetable for the final selection interview has been released online. 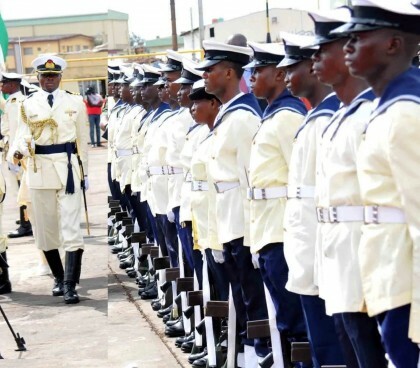 “Candidates are therefore, advised to check online at www.joinnigerianavy.com for the newly -adjusted timetable. “Candidates in Batch A are to report for the selection interview from Aug. 25 to Aug. 31, while those in Batch B are to report for the exercise from Sept. 5 to Sept. 11. According to the statement, the selection interview will hold at the NN Secondary School, Ojo, Navy Town, Lagos State. It said that candidates should report to the centre with originals of their credentials, sporting kits and writing materials for the exercise. The statement advised the candidates against patronising online fraudsters, who used fake Facebook accounts bearing names and pictures of serving senior naval officers to extort them.